After the recent chemical spill that left nine counties in West Virginia without usable water, the Senate is working to pass legislation that will increase regulation on liquid holding tanks and ensure this type of crisis will never happen again anywhere in the state. The Joint Commission on State Water Resources, comprised of five Senators and five Delegates, has been investigating the causes of the chemical leak and exploring ways to prevent a future incident from occurring. The Joint Commission has been holding hearings to get opinions and recommendations from water experts. During the first hearing, legislators heard from Paul Ziemkiewicz, director of the West Virginia Water Research Institute. Ziemkiewicz explained that according to the West Virginia Code, Freedom Industries, the company responsible for the chemical leak, should have had records with a description of the chemicals along with an emergency response plan in place. Freedom Industries should have also been undergoing regular inspections. The Joint Commission heard from Evan Hansen, president of Downstream Strategies, during their second hearing. Hansen explained to the committee why regular inspections hadn’t taken place and recommended how the state should move forward from the water crisis. According to Hansen, Freedom Industries held a National Pollutant Discharge Elimination System (NPDES) permit, which the West Virginia Department of Environmental Protection (WVDEP) agency was responsible for enforcing. The WVDEP failed to regulate Freedom Industries or enforce their NPDES permit. Hansen suggested that the state government should make clear their expectations for regulation of these storage tanks to the WVDEP. Additionally, the WVDEP should be held fully accountable for comprehensively and regularly enforcing permits and all environmental laws. Under Hansen’s recommendations, the WVDEP would be required to inspect all NPDES-permitted sites, inspecting the most critical sites first. Hansen believes that the governor and Legislature will have to increase funding and staffing for the WVDEP’s environmental enforcement programs to ensure that they have the resources to enforce permits and inspect all NPDES-permit sites. 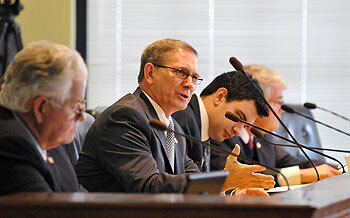 After hearing from experts, Senator John Unger, chair of the Joint Commission on State Water Resources, has taken the lead on Senate Bill 373, a bill that he, along with many other Senators, believe would protect all West Virginians from experiencing chemical spills due to faulty holding tanks and lack of regulation. The bill would require all aboveground storage facilities that store any liquid other than water and aren’t currently registered or being inspected, to be registered with the Secretary of State’s office and inspected regularly by the WVDEP. Senate Bill 373 seeks to protect the water of all West Virginia residents, not only those affected by the chemical leak at Freedom Industries. “This is not just a problem for Charleston or for that matter it’s not just a problem related to above-ground storage tanks -- this is a problem that affects all of us that drink water in West Virginia,” said Hansen during the hearing. Other areas of concern in the state include Morgantown with 55 sites of critical concern and Huntington with 424 sites of critical concern. Water contamination due to a chemical leak could happen anywhere in the state, but this legislation would help to make certain all liquid holding tanks are registered and being maintained adequately. The bill was passed through the Senate Natural Resources Committee and must be approved by the Senate Judiciary Committee before it is brought to the floor for consideration. West Virginia is known as much for her natural beauty, forests, mountains, rivers and streams as it is known for anything else. In a continuing effort to keep West Virginia clean, the House of Delegates passed a bill this week, House Bill 4014, which would increase the criminal penalties for littering. The changes to current law included in this proposed legislation make the potential fines much more substantial while also eliminating the ranges and increasing the community service for convictions for littering. The fine, upon conviction, for littering amounts less than 100 pounds or 27 cubic feet would increase from a range of $100 to $1,000 and instead makes the penalty $1,000. It would also change the community service from a range of 8-16 hours to 100 hours. Additionally, the fine, upon conviction for littering amounts more than 100 to 500 pounds or 27 to 216 cubic feet would also increase from a range of $1,000 to $2,000 to a fine of $2,000. The community service penalty for this offense would increase from 16 to 32 hours to 200 hours. In both instances the words “or both” have been removed to indicate the court must decide between the monetary or community service penalties rather than a combination of both, as is currently permitted. Finally, the proposed bill sets the fine and penalty for a conviction of littering more than 500 pounds or greater than 216 cubic feet at between $2,500 to $25,000 as well as confinement in jail for no more than one year, or both. The bill would also double the penalty for a second or subsequent violation. Potentially, the increased fines and community service will go far to discourage people from littering and throwing their waste away recklessly. It is suspected the state spends over $1 million cleaning up litter from the state highway system alone. Litter does more than degrade the quality of life and damage the natural beauty of the state, it harms the animals, costs taxpayers in cleanup costs and, may impact business and residents from locating in West Virginia. The bill passed the House unanimously and must now be considered by the Senate for final approval. House Bill 2757 would call for the euthanizing of a dog that has either attacked twice in two years or caused $1,000 worth of damage with its attack. This would only apply if the person attacked was not at fault. House Bill 4003 would grant dual jurisdiction to counties where a student lives in one county and attends school in another to enforce truancy policies. Either county has concurrent jurisdiction for the trial of offenses. House Bill 4191 would raise taxes and tobacco-related products. The tax on cigarettes would be raised to $1.55 on each 20 cigarettes (a “pack”) and 50 percent of the sale price of any other tobacco product. Tax money will go to the Bureau for Medical Services, and each fund or program receiving money will have to provide a report to the Legislative Oversight Commission on Health and Human Resources Accountability every three years on how funds are being used. House Bill 4194 would adopt new rules for traffic control signals. While it would still be legal to enter an intersection on yellow light, a traffic violation would occur if the driver has not cleared the intersection by the time the light turns red. House Bill 4199 would require a federal background check based on a name search to become a nurse after two sets of fingerprints have been rejected as unreadable. House Bill 4209 would prevent a person from being disqualified for unemployment compensation benefits when they are out of work due to domestic violence, sexual offenses or stalking by family or household members. Claims would be evaluated and aid employees would be trained on how to interact with claimants. The claimant must seek and accept work to remain eligible. The employer would not be chargeable for benefits paid. House Bill 4211 would permit motor vehicles belonging to drivers who have been arrested on at least four occasions of impaired driving to be seized, impounded and forfeited. If the vehicle was damaged while the driver was impaired, the Division of Motor Vehicles will notify the driver’s insurance company. Impounded vehicles may be sold under certain circumstances. House Bill 4212 would create a methamphetamine registry and would restrict the sale of products containing ephedrine, pseudoephedrine and phenylpropanolamine. The registry would contain the person’s name, date of birth, offense, conviction date, county of those offenses, and convictions prior to the current conviction date. Prosecuting attorneys would have to submit conviction information, which would be kept on a website operated by the state police. When someone would attempt to buy products that contain the these ingredients, the pharmacy or retailer would submit a driver’s license number. If the person is registered, they would be denied the sale. House Bill 4214 would encourage and assist those with schizophrenic reality disorder in designating a durable medical power of attorney to help the patient avoid future involuntary commitments when the patient is unstable. The chief medical officer of the mental health facility will help the patient find their attorney upon release from the facility. House Bill 4223 would require a search warrant to perform a secondary blood test to determine the alcohol or controlled substance concentration in a driver’s blood. House Bill 4236 would establish a state-wide system for sexual assault forensic examination services. This legislation would create the Sexual Assault Forensic Examination Commission, which would be chaired the director of the Division of Justice and Community Service. County and regional boards would have to identify facilities that are appropriate for receipt and treatment, assess and designate physicians and nurses, evaluate the needs and resources of the area to facilitate and encourage 24 hour, seven day a week coverage, provide transportation if the person is in a remote region, and create an alternative plan if there is a change in circumstances. House Bill 4254 would provide a paid leave of absence for certain state employees that are essential members of an emergency aid provider during a state of emergency. The paid leave of absence may not be more than 15 days and the total cost among all state employees may not exceed $300,000. If passed, it will be in effect retroactive to January 1, 2014. House Bill 4264 would provide protections for the medical use of cannabis and prohibits discrimination against those entitled to it. It would be permitted to those with a debilitating medical condition. A patient would not be permitted to have more than six ounces or twelve mature marijuana plants and twelve seedlings. House Bill 4267 would legalize and regulate the selling of fireworks and create the West Virginia Veterans Program Fund. There would be a 10 percent tax on the fireworks, with the proceeds going toward the Veterans Program Fund. Senate Bill 3 passed the Senate on unanimously and has moved to the House for further consideration. This proposal would allow a real property owner to give property to their beneficiary directly without the owner’s will being approved by a court of law. Senate Bill 278 was passed unanimously in the Senate and has moved on to the House for further consideration. This bill would redefine scrap metal to exclude gold, silver, palladium and platinum jewelry, bullion, ingots or coins. These items could no longer be considered scrap metal and therefore could not be sold or purchased by a scrap metal dealer. Senate Bill 382 would exempt certain veteran organizations and active duty United States military organizations from indoor smoking regulations adopted by local boards of health. Senate Bill 384 would prohibit certain insurers from making people, covered under certain insurance contracts, use a mail-order pharmacy. This proposal allows a person the option of using a mail-order pharmacy or a nonmail-order policy to fill prescriptions as long as the prices are comparable. Senate Bill 387 would clarify that duly authorized officers of the United States, Washington D.C. or other states, have legal custody of their prisoners while they are in West Virginia. This bill clarifies who is responsible for a prisoner when coming to or passing through West Virginia. Senate Bill 390 would call for misdemeanor criminal penalties for people who knowingly and willfully use automated telephone calls to spread false, misleading and or deceptive information during a declared state of emergency. Senate Bill 396 would eliminate boards, councils, tasks forces and committees that are no longer necessary to the State. Senate Bill 397 would more clearly define the scope of financial exploitation of the elderly and other protected people, and would decrease the age of an elderly person from 65 to 60. Senate Bill 403 would would prohibit any species of carp to be possessed, sold, offer to sell, import or released into the waters of West Virginia. Senate Bill 409 would align schools and schools system accreditation. This proposal would establish critical need alternative teaching certificates, modernize school buses by adding propane as an alternative fuel to reduce additional transportation costs, and address transferable college credits. Senate Bill 411 would raise the West Virginia Minimum wage gradually by July 2016. The raise would be in two steps and would raise from $7.25 per hour, to $7.85 by June 30, 2015, and by July 1, 2016 to $8.25. Senate Bill 419 would provide amnesty for a person who seeks medical care for themselves or someone else who is possibly experiencing an overdose. This bill would protect people from charges if they are experiencing an overdose and need to go to a hospital. This would prevent overdose by decreasing fear of prosecution so the person is more likely to get medical care. Senate Bill 422 would give students financial aid for professional degrees out-of-state that aren’t offered in West Virginia. Upon graduation with the professional degree that student must come back to West Virginia and work for as many years that the student received financial aid for, or the student can reimburse the state the amount of financial aid they received. The Joint Commission on State Water Resources meets Friday to hear from representatives of the Chemical Safety Board and the WV Environmental Council.